Tracked planter has 400-acre corn planting capacity on one fill. Bigger, faster, more efficient are the hallmarks of new farm machinery. The Model 8936-30 White Planter introduced by Agco at its Kansas City product launch Aug. 8 has all three of those bases covered. With its factory-installed rubber track transport system, it can also get into wet fields earlier in the spring. 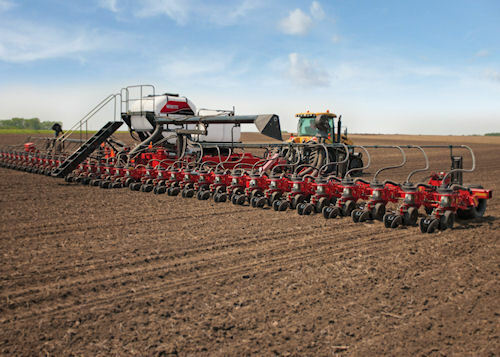 The 36-row planter with 30-inch row spacing moves down the road at a width of 15 feet, but unfolds to 90 feet. It features two 75-bushel seed tanks and two 750-gallon liquid fertilizer tanks, giving it the capacity to plant 400 acres of corn before stopping to refill. The White 8936-30 planter rolls down the road at 15-feet wide but unfolds in the field to 90 feet. It is built on a heavy-duty frame (empty weight tops 50,000 pounds) but thanks to its tracked transport produces only about 12 psi of compaction weight in the field, compared to 32 to 35 psi for wheeled planters of comparable size. A 12 cc piston-style orbit motor on the central fill system fan provides consistent airflow to all 36 rows and it comes with pneumatic row-unit down pressure and GPS-compatible automatic row-shutoff as standard equipment. Agco says the list price will be "north of $250,000" and the target market is large farm operators who need big machinery to get their seed in the ground in the optimum 10-day window for planting time.